When you create a new board in Pinterest, you have a “Who can pin?” option. 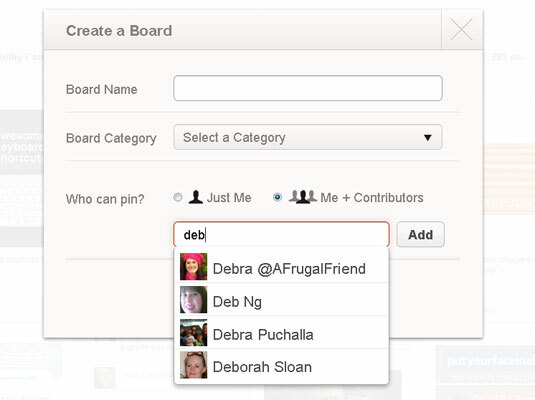 To create a group board, select Me + Contributors. You can add members either by their Pinterest member name or their e-mail address. If you start typing a member name in the text box, Pinterest automatically populates a list of possible matches, and you can select the right person from the list. Then just click the Add button next to the name. Create a pinboard that other Pinterest users can post to. To invite someone via e-mail, type or paste in e-mail addresses one at a time in the field that appears when you click Me + Contributors and then click Add. Some people don’t like to be added to boards without being asked first, especially because the boards then appear on their own profiles. When in doubt, it’s best to check with people first before you add them to a group board.